Get a free gift whether you buy Reason, Balance or both. 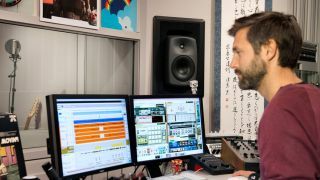 Propellerhead's UK Distributor Sound Technology has announced a couple of special offers for UK customers who buy Reason or a Balance audio interface during December. Buy and register a new Reason or Reason Student/Teacher Edition package (full versions, not upgrades) in the UK or ROI between 1 - 31 December 2012 and you'll automatically receive the Reason Drum Kits 2 ReFill worth £89 absolutely free. Once you register, a Drum Kits 2 ReFill licence will be added to your Propellerhead account and you'll be able to download it. Buy and register Propellerhead's Balance audio interface in the UK or ROI between 1 - 31 December 2012 and you can claim a free Propellerhead laptop bag worth £49. Also bear in mind that if you are an existing Reason v1-5 owner Balance comes with a free upgrade to Reason 6.5. For full details of the offers please visit Sound Technology.